Taking A Chance In The Garden . . . If you’ve been following this blog for a while, you may recognize that photo up there from my month-long RAW trial back in March. I picked up that strange fruit, labeled as ‘Spiny Melon’ from New Zealand, when I was making some tropical fruit sushi. 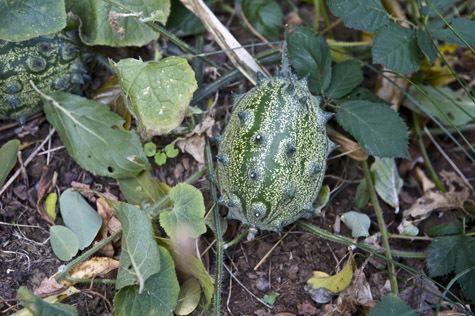 I just couldn’t resist the way it looked, and I figured it would be sweet inside, like other melons I love. But cutting it open, this barbed little beast was nothing like what I expected. The inside was very seedy, with a watery flesh that was certainly not sugary. It reminded me of something but I just couldn’t place it, until Damian took one bite and said, “Oh, it’s a cucumber.” Yes! That’s exactly it! 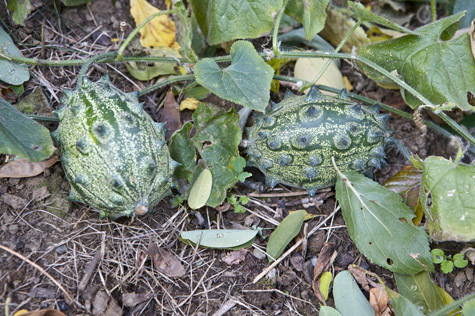 The spiny melon is an exotic, wild cucumber. So just for fun, and because it was March and I was eager for planting season, I decided to take a gamble. I rinsed off a bunch of the seeds, and spread them out on a paper towel (this was back before I stopped using paper towels) to dry. A few weeks later I remembered about them, fashioned some newspaper seed pots, and plunked them into potting soil. They actually sprouted! So I put them into the ground, right amongst my corn stalks, and they took off. They grew! And grew . . . and grew . . . and overtook the corn, and the butternuts I’d planted alongside, and anything else nearby. They were these creeping curly prickly vines that just covered everything! But I never saw them flower – all I ever saw was leaves and vines and curly-q crawlers. So in early fall I finally gave up on them. It was winter prep-time anyways. I put on my gloves (the vines were so thorny!) and began pulling up the vines. I’d gotten maybe 3/4 of the way through the bed, when suddenly something caught my eye. This stalk I’d just cut . . . bore a teeny tiny yellow flower! I dug a little deeper, and lo and behold, what did I find underneath? . 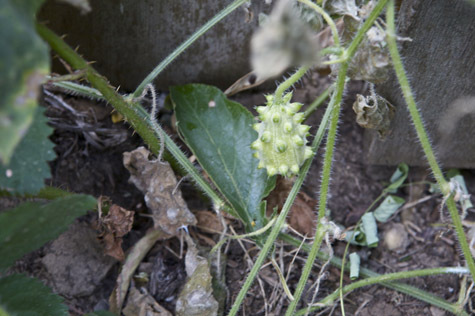 . .
Spiny cucumber! I did it!!! Excitedly, I dug into the remaining vines. To my delight and surprise, I uncovered an entire crop of those funny foreign fruits, imported from the land of the Tuatara and the Kiwi bird. You can try this too, with anything you bring home from the grocery store! Some of them will be viable, some of them will be sterile. You’ll never know until you plant ‘em. But, you may just end up with your own peculiar little garden, too! Check out the adorable wee baby spiny! BONZAI! Is there anything you CAN’T f***ing do?!?! LOL. I get so excited when I read your blogs sometimes. It’s hilarious. I want to get up and do a little dance or somethin’. Ha! I’m glad you did this experiment cause I was curious if I took some seeds from the acorn or butternut squash I purchased if they’d grow. Long, long ago I heard from a fellow gardener that some fruits and veggies you just can’t harvest seeds from….particularly corn. You HAVE to buy corn seeds in order to grow corn stalks. There’s no way to take a corn cob and use those kernels to grow corn later. They’ve been genetically modified in some sense. I haven’t even researched this yet. Have you heard of such a thing? I know you are not *supposed* to put seeds into the compost bin, but finding seedlings sprouting in there is one of my favorite things! I had an experimental gardening bonanza on Wed. and planted 2 squash seedlings, 1 pepper seedling, 1 unidentified seedling, a bunch of garlic cloves, and sprinkled a bunch of seeds from my teeny tiny adorable ornamental pepper plant into the compost to see if they will sprout. All of the things I planted are in containers, probably far too small, and I live in Chicago and it’s November, so I am not unreasonably optimistic, but it’ll be fun to see what happens! Thanks for sharing your adventures and inspiring mine! this is great you took something from all the way across the world and made it local. I hate to buy things that are not from within 100 miles but I am always so tempted by exotic fruits. this makes it seem like a fair compromise. That is really exciting, but aren’t you not supposed to plan things from other countries in case they take over local plants? I’m pretty sure that’s a law… I won’t report you. haha. that is sooo cool! I’m going to try this. My mom grew one of those things this summer as well. I’m not a huge cucumber fan, but it was pretty. I think she called it a “lemon cucumber”, but I swear it looked just like that. Tenise Rae – You should def watch the film “King Corn” if you’re interested in corn production and farming in the US! I’m with you, Jackie- my family all talk about how to avoid these volunteers, but my Geef and I really enjoying seeing what craziness manages to survive. Most sneak attacks seem to be perpetrated by heirloom tomatoes, but they never seem to come up for us as nearly as nice as the ones we originally bought. I love Cukes, but we never get them coming back- maybe they just can’t make it through the whole composting cycle. 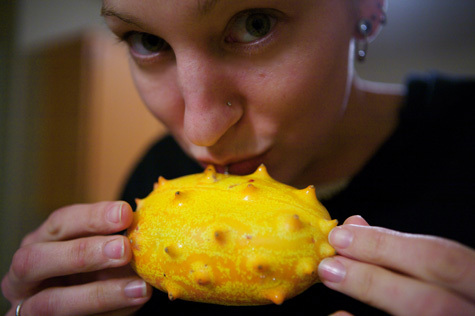 Janine – I LOVE lemon cucumbers, but they aren’t quite as spiney as what Sayward grew. They have what I like to call “nubs” on them. LOL. So good…seriously! you are such a cool chick!! great work! @ Tenise Rae – Aww, that makes me SO happy! I love that my blog can bring you joy and I love sharing my crazy journey, so thank you for reading along! I think with store-bought seed saving, it just depends on the fruit/veg. I’d imagine your friend is right about corn, since most of it is so messed with these days. 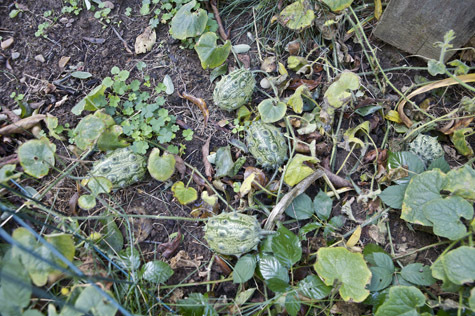 As for others like squashes and stuff, try to save seeds from organic products, as they’ll be much more likely to grow. For my soil, I try to garden ‘veganically’, which means I won’t buy most fertilizers and soil amendments because they’re pretty much entirely animal-derived. I do use my own chicken’s poop and I compost. I mulch each autumn which helps. Throughout the planting season I fertilize (infrequently, unfortunately) with a seaweed-based product. I should write an article on this . . .
Good luck with all the new growing! @ Sleepybird – That’s a great point, I hadn’t even thought about it like that, ha! @ Jenny B. – Yay! Do it! @ Janine – Yes, I’ve had lemon cucumbers! They are similar and I’m sure they’re really closely related. I think lemon cucumbers are so adorable. @ Kathryn – I know, so cute right?! And King Corn is high n my list of docs to watch. @ Nathan – I think squashes and gourds are pretty common culprits as well. It’s like a lucky score, why would anyone want to avoid that!? Your garden looks great. I stumbled on your blog looking at potato gardens in tires. I just started mine and the first sprouts have arrived. I also enjoyed looking all you grow….good stuff. I have a small plot of land in a place called Cabbagetown in Atlanta. I grow as much stuff as I possible can. Gardens rock!! !